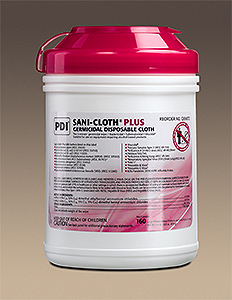 These wipes are ideal for surface disinfection of stainless steel, countertops, glass, etc. Each wipe contains a germicidal disinfectant effective against Influenza A 2/HK; Herpes Simplex Type II; Polio I virus; HIV-1 virus. Available in Large (6" x 6.75") or Extra-Large (7.5" x 15").